Wairoa Special School Fund Raiser 2012 – We did it! The Bridge Run has been crossed and finished! 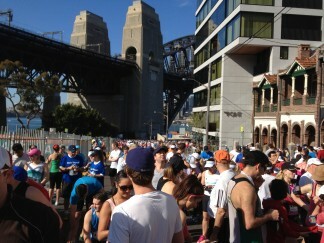 It has been six weeks since we ran the Bay Run. The weather was perfect. 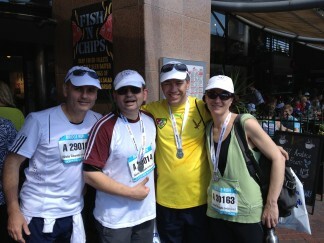 Steve, Crystal, my brother Mark, and yours truly were ready to go. Many thanks go to the help of my fellow members of Team Wairoa in training in the weeks leading up to this day. Without them I would not be ready for the run. This year the course has been changed so we did not finish at the Opera House but at the Conservatorium of Music. 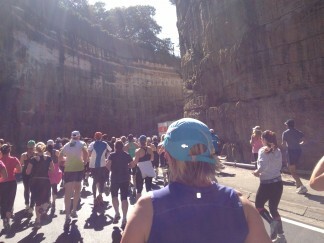 For the first time, after we run across the Bridge from Milson’s point, we will venture down the “corkscrew” tunnel that leads on to the Cahill Expressway. From there it is down to Macquarie St, then College St to the end of Hyde Park. Then into the Art Gallery Rd, down to Lady Macquarie’s Chair, and loop back to Macquarie St and turn down to finish at the Conservatorium of Music. 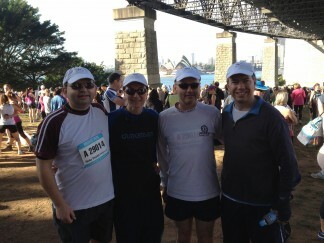 Before the run, we set out separately to get to Milson’s Point and incredibly we all arrived on the same train! I don’t what this means but I thought I’d share this with you all. Anyway, a glorious warm day in Sydney awaited us! Thank Goodness! At 9am we were let loose. All 35,000 of us! It’s incredible to see a sea of humanity (to use an old cliché) all crazy enough to be doing the same thing at the same time – wrecking our bodies on the hard road surface. Thanks to the pacesetters of Team Wairoa, yours truly got to the end (my brother was very good in giving me the occasional prod when legs started to say WALK). Crystal and Steve finished in 55mins and the Seymour brothers finished in 69mins (really my brother waited for me by running along side of me). 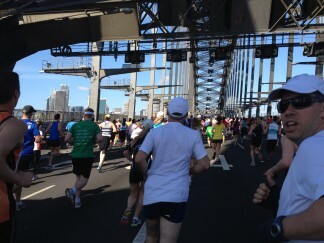 It’s incredible to realize that most of the runners were there to raise money for various charities. I would like to thank all those who have donated to help the Special School of Wairoa whose students will benefit greatly from the donations. The amount looks to be about the $2500 mark, may be more. Thank you all for helping us turn possibilities to realities for these children and their families. Wairoa School, located at Bondi, provides quality educational programs, in a caring environment, for 65 students with intellectual and multiple disabilities in the 4 – 18 years age range drawn from the eastern and inner west areas of Sydney. All donations will go to Wairoa Gift Fund and are tax deductible. The donations are allocated specifically to resources and programs that benefit the students. If you or your family or friends would like to sponsor us that would be great. Monies can be sent to school by logging on to the website at http://www.everydayhero.com.au/anthony_seymour_5. Or come into the surgery and make a donation.